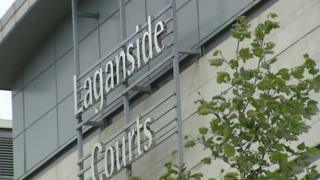 A man has appeared in court in Belfast accused of a series of break-ins on New Year's Eve. Emmanuel Smyth, 31, who has no fixed address, is charged with three counts of burglary. He is also accused of aggravated vehicle taking, damaging a pillar and assaulting another car owner who confronted an intruder in his home. In one instance, a pensioner got into the passenger seat of her car to stop it being stolen. Shortly after midnight on 31 December, a resident in Forthill Gardens, Newtownabbey, phoned police to say he had found a man inside his home. The intruder fled after he was discovered. A short time later, police said that a burglar entered a house on Doagh Road and stole car keys. He then tried to drive off in the car, but was stopped by a woman in her 70s who got into the passenger seat. He ran off, but the woman fell from the car and suffered minor injuries. Within an hour, police said that a resident in Church Terrace disturbed a stranger in his kitchen. He had taken car keys and tried to take the vehicle but, when confronted by the homeowner, he threw the keys and ran. Mr Smyth was later arrested and charged with the offences. He was remanded in custody to appear by video-link on 29 January.